Nesbeth has scored another hit. Success Story , produced by Oneil “Foota Hype” Thomas, is creating waves on radio and has resonated with music fans. “The inspiration behind Success Story is really the story before the success,” Nesbeth explained in an interview with Splash. 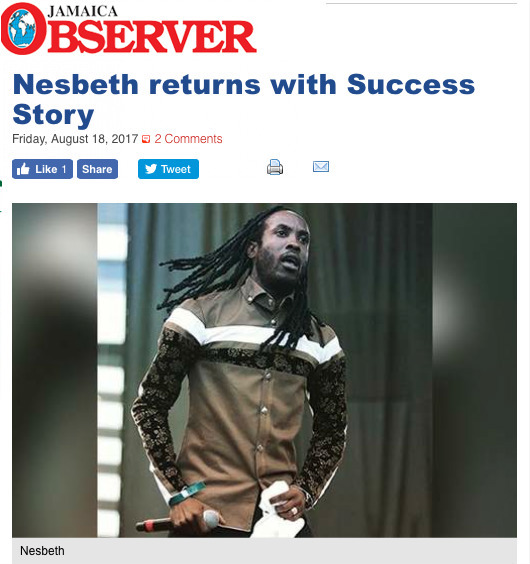 Success Story is a follow-up to Nesbeth’s 2015 massive hit My Dream, which topped several reggae charts locally and overseas. My Dream opened several doors for the entertainer who had previously scored hits including Board House and Drive By. My Dream gave me the opportunity to perform at several major shows worldwide, as well as the ‘inauguration’ of Prime Minister Andrew Holness at Jamaica House,” Nesbeth said. “It was a bit of a challenge because he’s more of a dancehall producer, but we did what was necessary to get where we at,” he said. The video for Success Story, directed by RD Studios, is to be released in a matter of weeks. Last weekend Nesbeth performed at the at Britain’s Indigo (O2 Arena) for the 2017 staging of Jamaica House alongside Jesse Royal and Ziggy Marley.